In the World Bank’s latest Logistics Performance Index (LPI) report titled “Connecting to Complete 2016”, the Logistics Sector in India climbed 19 places, moving up the ranks from 54 in 2014, to 35 this year. But would the new GST bill prove to be an obstacle in its growth in 2017? As the Goods and Services Tax (GST) regime announced by the Finance Minister ready to go effective by April, 2017, enterprises are becoming apprehensive about its impact on the operations of their businesses. However many industry experts have summarized that the effects of GST’s slab-wise taxation will rather bring in new wave of opportunities for growth in terms of better quality of services at a comparatively lower cost, particularly in the logistics sector. The current established tax structure levy varied central taxes in form of custom duty, excise duty, CST in addition to very Indian state checkpoint levying states taxes at different rates, viz. 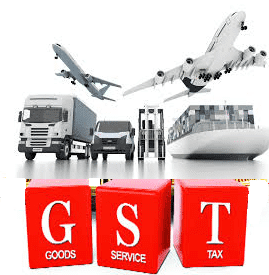 of VAT, service tax, octroi, etc, for the goods that move across their borders. Adding to the complexity, is levying of state level taxes on top of central taxes, thus multi-taxation to the consumer. Let us look at the slab structure agreed by the GST Council, which is 0%, 5%, 12%, 18% and 28%, with lower rates for essential items and the highest for luxury and de-merits goods. To escape the current multi-tax burden, the manufacturers and third party logistics companies generally transferred stock to warehouses set up in various states of operations, thus avoiding central taxes to an extent. The priority for Logistics Service providers today has remained on tax and administration optimization, mostly compromising on achieving higher operational efficiency through structured large warehouses planned in centralized geographic locations that gives better connectivity. With the proposed change, FMCGs that are currently paying around 24-25% of tax, including excise duty, VAT, etc will only shell out 17-19% with GST, therefore generating lot of potential for progress and open doors for investment in the industry. There will be subsequent rise in warehouse mergers adopting complete automation which will be cost effective to the owners. Thus, GST bill’s introduction of slab rates in taxation and one point taxation at the start of the sale will undoubtedly benefit the logistics sector, as it eliminates the practice of multiple levies as well as one rate of taxation for all goods and services. Another biggest irritant has been the queuing time at the various checkpoints at state borders. Considering that the significant percentage of goods in India is transported by road, delay in transit time has significantly affected efficiency of operations and cost of transport. The World Bank has already indicated in its reports that the cost of logistics in India are already higher by two-three times than the global benchmarks. But with GST in place, this scenario will hopefully change completely, as the goods will be able to move freely across states, and will undoubtedly demolish the obstacle of waiting hours, delays in its delivery, and thus the reduction in costs. Reduced costs will have a accretive effect on the entire distribution channel, thus benefiting the end consumer with efficient cost of certain categories of products. But again with GST, while some industries will benefit as they will be paying lesser than the current tax rates payable, others such as tobacco and aerated drinks might be hit with an increase by 20% on what they are paying currently. The other drawback has been the Technology /automation costs, which was not practical for maintaining smaller warehouses, and has resulted into labour oriented manual system which can be erroneous, slow and of poor quality. Although labour is a cheap resource in India, but with GST in implementation, new warehouse hubs will be established with an introduction of fully automated Technology, to enhance efficiency and achieve international standards. On the other hand, GST will certainly contribute positively towards the further development of ecommerce industry, as goods and services will be logistically available to them more freely. However, a trivial effect can be felt with increased administration and documentation, but the reforms proposed will open new avenues for foreign investments, and upgrading of the entire transportation and warehousing sectors in India. As for the 3PL, the companies will restructure their business operations based on more-in-demand locations for warehousing, without tax considerations. This will lead to better optimization of facilities, up sizing of warehouses, time efficiency and improved automated services, offering more value for the money spent to the end consumer. The introduction of GST regime will bring in international competitiveness and discourage tax avoidance. GST will now free the decision regarding warehousing and transportation, allow free movement and supply of goods in every part of the country, therefore creating one single unified market in India, and the benefits of this scenario will be enjoyed by all stakeholders- manufacturing chain, supply chain and retail chain.